A new British aid package for Pakistan, announced by Prime Minister David Cameron in Islamabad, is worth $1,055 million over four years. The money will fund education for up to 4 million students, train 9,000 teachers, purchase 6 million new text books and build 8,000 schools by 2015, according to various media reports. Announcing new aid, Cameron said, “I struggle to find a country that’s more in our interest to progress and succeed than Pakistan." “If Pakistan succeeds then we will have a good story ... if it fails we will have all the problems of migration and extremism, all the problems", he added. With growth in the last decade, a number of countries like China, India and Pakistan have transitioned from low- to middle-income status under World Bank classifications. But China and India together still account for about half of the world's poor, and most of the illiterates, according to The Guardian. The focus of the OECD nations and the World Bank should be on helping all of the poor people regardless of whether they live in low-income or middle-income countries. Such help needs to be specifically targeted toward human development programs like education and healthcare. Earlier this year, a Pakistani government commission on education found that public funding for education has been cut from 2.5% of GDP in 2005 to just 1.5% - less than the annual subsidy given to the PIA, the national airline that continues to sustain huge losses. The commission reported that 25 million children in Pakistan do not attend school, a right guaranteed in the country's constitution, and three million children will never in their lives attend a lesson, according to the BBC. The report added that while rich parents send their children to private schools and later abroad to college or university, a third of all Pakistanis have spent less than two years at school. The report concluded that Pakistan - in contrast to India, Sri Lanka and Bangladesh - has no chance of reaching the UN's Millennium Development Goals for education by 2015. Will the additional British aid bring new focus on education in Pakistan? Is it still possible for Pakistan to achieve the UN's Millennium Development Goals for education by 2015? I certainly hope so, but it will take a renewed national focus in both public and private sectors of the country. Fortunately, there are a number of highly committed individuals and organizations like The Citizens Foundation (TCF) and the Human Development Foundation (HDF) which are very active in raising funds and building and operating schools to improve the situation in Pakistan. It is important that all of us who care for the future of Pakistan should generously help these and similar other organizations. Who's going to monitor the money???? Mayraj: "Who's going to monitor the money????" I just hope the Brits will insist on some level of accountability, and the media will help expose fraud and abuse. What really develops countries is institutions not aid. The focus in normal times should be institutional building and access to markets to help poor countries. HOWEVER the above is assuming the West's intentions are always altruistic which they certainly aren't. There was recently a v good article in India's economic times castigating Bill gates and he like. Bill Gates is also a major shareholder in big pharma and companies like Monsanto for whom his charity creates beachheads via the bill and melinda gates foundation. He also has a huge PR budget to portray himself as a guardian angel of the poor and desparate instead of a rapacious monopolistic capitalist who he always was and still his. The other issue is the British have shown zero capability of educating their poor own people (same holds true of US). It is good to get their money;but, the job of figuring out how to improve the education of the poor shouldn't rely on their expertise! Pakistan needs guidance from govts that have done well with ltd funds. Also we need to build economy so the educated do not go to UK to provide cheap foreign labor and stay in Pakistan instead! It shows PK's priorities vs UK's priorities. It's more than screwed up priorities; it's extremely poor governance. If they just fix the problems of corruption and incompetence at the PIA, the subsidy given to the airline can be allocated to education and double the education budget. And just about every state-owned company, from steel mill to railways, is losing tons of money money and imposing a huge burden on taxpayers. Remember, when Musharraf and Aziz tried to privatize the steel mill to cut the drain on the treasury, the politicians and the judges all screamed "corruption" and prevented it. Now the steel mill itself is hemorrhaging a lot more of taxpayer rupees than it was under Musharraf. Anon: "A golden rule about privatization is you should never sell in a situation when you are desparate for cash." Is it not better to cut your losses and focus on the future of the nation by investing in education? BTW, the steel mill was in much better shape, and losing less under Mush than it is now. The situation has has gone from bad to worse! If you sell a state organization today for x when in 5 year time the capital stock itself(prime land buildings licenses etc will be worth 2-3 x why not wait? British rail privatization was a disaster as were several ill thought out Indian privatizations in the 1990s. Not to mention the disastrous 'shock therapy' privatizations in yeltsin's Russia. The last thing Pakistan now needs is for the feudals(who have most of the capital) to mutate into Russian oligarch style robber barrons. Riaz, it's time to update those illiteracy graphs. This year's Indian census results have come and Indian literacy rate has risen to 75% with youth literacy rate well above the international average. Irfan: "Riaz, it's time to update those illiteracy graphs." 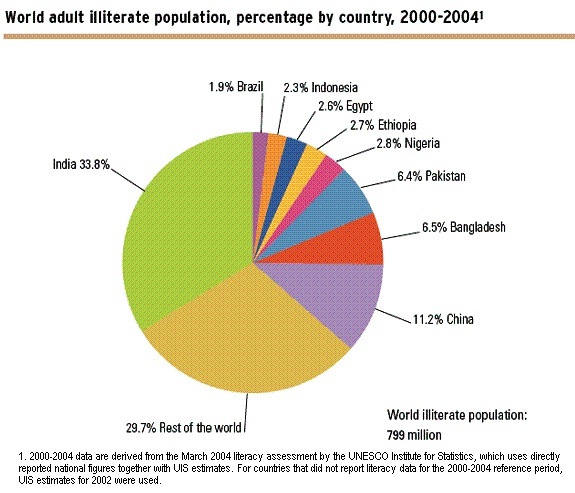 The UNESCO illiteracy graph from "Education For All" report that I have used shows proportions of illiterate adults in the most illiterate nations of the world including India followed by China, Bangladesh and Pakistan. I don't believe the relative position of India as the nation with the world's largest population of illiterate adults has changed since last year. ISLAMABAD // Growing international aid flows into terrorism-torn Pakistan are vulnerable to widespread abuse because of endemic nepotism within the government and domestic non-government organisations, according to non-profit sector insiders. The threat is exacerbated by negligent management by international donors, whose ability to audit projects is limited both by security-related restrictions on the movement of personnel and their susceptibility to elitist social circles dominated by their clientele, NGO managers and consultants said in a series of interviews. NGOs emerged as an alternative recipient of foreign aid to Pakistan in the late 1980s, following the withdrawal of Soviet occupation forces from neighbouring Afghanistan and decreasing US funds, and became the preferred recipients as relations between the government and its erstwhile allies deteriorated in the 1990s. The role of the NGOs increased as civil war flared in Afghanistan and more refugees poured into Pakistan. However, many NGOs were formed not by idealists, but "by well-educated people with social and political connections," said Arshed Bhatti, an Islamabad-based consultant to NGOs . Often, they are relatives and cronies of military officers, politicians, civil servants and judges that "invest in 5-to-9pm socialising [with Pakistani and foreign officials], and execute the agreements the next 9am-to-5pm", he said. Subsequently, a large chunk of funding keeps going to the same people, who take two bites at foreign funding by forming their own NGOs and working as lobbyists for others, Mr Bhatti said. Research by The National revealed numerous examples of human rights NGOs with trustees who are senior government functionaries, including serving federal and provincial ministers, all of whom are in a position to lobby for and secure funding from both international donors and the Pakistani government. Baber Javed, programme manager for the Pakistan Centre for Philanthropy, which certifies corporate social responsibility initiatives for the government, said problems within the non-profit sector were largely attributable to the restrictive practices of major international NGOs, including the humanitarian arms of the United Nations. Does anyone knows how many British based companies will be given mining and exploration licenses in Pakistan. What is in it for Britain, why they are giving money while their own masses are going through tough times? I have one question for you is blog only to show improvement of pakistan & to shoe India in bad light? there is no post about Anna Hazare's action against corruption in India. I think that would also inspire some movement in Pakistan. Announcing new aid, Cameron said, ............ “If Pakistan succeeds then we will have a good story ... if it fails we will have all the problems of migration and extremism, all the problems", he added." riaz, you could be proud that these are the best words, a foreign head of state could make when he comes to your country!!! Zen:"riaz, you could be proud that these are the best words, a foreign head of state could make when he comes to your country!!!" Welcome back after a long pause! As someone said, "Swallow your pride occasionally, it's non-fattening! " I have no shame in swallowing my pride or "ghairat" if it helps educate Pakistan's poor kids who are being ignored by corrupt and incompetent rulers. It's a small price to pay for a better future. Have you checked out http://tac.edu.pk i think an article on TAC would be nice post for your web site. Mayraj: "The other issue is the British have shown zero capability of educating their poor own people (same holds true of US). It is good to get their money;but, the job of figuring out how to improve the education of the poor shouldn't rely on their expertise!" 1. I think the British aid, and aid from other nations, is needed to support Pakistan's badly neglected public education sector. 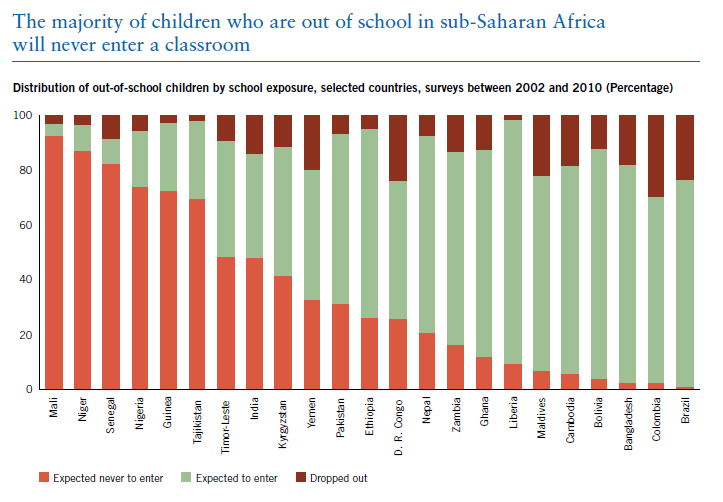 I think Pakistan kids would probably also perform poorly on PISA and TIMMS if it was administered there. Indian PISA scores for Tamil Nadu and Uttaranchal will be out this year. Next year the whole country takes the test. National pride aside(I won't be surprised if overall India shows up near the bottom. )these surveys give you a snapshot and point out glaring defficiency. You just won't find people with college degree willing to teach in villages. Its actually pretty sad India's overall literacy rate is 75% HOWEVER only 35% of kids finish even class X compared to 80% in China. U.S. economic aid to Pakistan, which totals over $1.5 billion per year, is a key part of the Obama administration's strategy to strengthen the U.S.-Pakistan strategic partnership. However, most of the aid that was allocated for last year is still in U.S. government coffers. Only $179.5 million out of $1.51 billion in U.S. civilian aid to Pakistan was actually disbursed in fiscal 2010, the Government Accountability Office stated in a report released last week. Almost all of that money was distributed as part of the Kerry-Lugar aid package passed last year. $75 million of those funds were transferred to bolster the Benazir Income Support Program, a social development program run by the Pakistani government. Another $45 million was given to the Higher Education Commission to support "centers of excellence" at Pakistani universities; $19.5 million went to support Pakistan's Fulbright Scholarship program; $23.3 million went to flood relief; $1.2 billion remains unspent. None of the funds were spent to construct the kind of water, energy, and food infrastructure that former Special Representative for Afghanistan and Pakistan (SRAP) Richard Holbrooke advocated for diligently when he was the lead administration official in charge of managing the money. Moreover, according to the report, the Obama administration hasn't yet set up the mechanisms to make sure the money isn't misspent. "While the facts of the GAO report are accurate, it doesn't reflect the big picture nor adequately represent what we've achieved with civilian assistance over the last year," said Jessica Simon, a spokesperson for the SRAP office. "As the FY 2010 funding was appropriated in April 2010, it is hardly surprising that only a portion of the funding was disbursed by the end of the year." Simon said that in total, the U.S. government has disbursed $878 million of Pakistan-specific assistance since October 2009, which includes over $514 million in emergency humanitarian assistance in response to the devastating July 2010 floods. The floods also slowed the progress of the Kerry-Lugar program, Sen. John Kerry's spokesman Frederick Jones told The Cable. "The floods last summer changed the Pakistani landscape, literally and figuratively, and required us to take a step back and reexamine all of our plans," Jones said. "Bureaucracies move slowly and redirecting aid at this level requires time and some patience. It is difficult to allocate billions of dollars in a responsible way without proper vetting, which takes time." Experts note that the disparity between U.S. promises to Pakistan and funds delivered is a constant irritant in the U.S.-Pakistan relationship. "There are always complaints and in terms of the delays there are pretty valid reasons on both sides," said Shuja Nawaz, director of the South Asia Center at the Atlantic Council. He said that Congress's requirement that the money be tracked and accounted for is a source of contention. "For a long time the U.S. didn't ask any questions about the money. And so it became a bit of a shock," he said. The GAO has long called for better oversight of the funds, especially in Pakistan's Federally Administered Tribal Areas (FATA). This lack of accountability is what spurred Congress to mandate better oversight of the Kerry-Lugar money, including provisions that require reporting on the Pakistani military's level of assistance to the United States. British Aid has NEVER helped any country to get out of poverty. We don't want it!Its mostly for creating beachheads for british pharma company as these 'aid' agencies routinely avoid much much cheaper indian pharma cos.
Incidentally Indian govt gets zero direct aid from any country these aid programs are NOT government to government. Aid is NOT the altruistic sacrifice that the above article is portraying it to be but gives british companies X 3-4 times return on investment. Anon: "We don't want it!" It depends on who "we" is. I know the urban middle class well-fed Indians don't want it, but India's neglected poor and hungry do...some of who are mentioned by BBC's Indian reporter Geeta Pande. If the British is cut, it'll cause tremendous suffering for many members of the world's largest population of poor, hungry and illiterates who call India home. Anon: "Aid should be confined to natural disasters and the like..."
With 7000 Indians dying of hunger everyday according to bhookh.com, it is a serious emergency in India that calls for international community to act for humanitarian reasons. Oh come on $500 million is the UK aid budget for India after expenses i.e salaries for aid workewrs,consultants etc etc you have about $300 million. So the net real aid is only about $100 million.I am sorry but somehow I don't see that amounting to much or causing tremendous hardships one way or another. I think Pakistan should kick its aid dependent habit sooner rather than later..
Aid DOES NOT help long term poverty alliviation. Anon: "Aid DOES NOT help long term poverty alliviation." It depends on what aid is used for. US Aid to India in 1960s for Green Revolution saved hundreds of millions of lives in India and other developing nations. And western aid is still saving millions of lives in India through vaccinations, feedings, toilet construction, pre-school and primary education etc. The agreement was signed by the Finance Minister Dr Abdul Hafeez Shaikh and German Federal Minister for Economic Cooperation and Development Dirk Niebel and European Commissioner for Development Andris Piebalgs at the finance ministry. The money will be spent from 2011 to 2013 on developing programmes for rural and natural resource, education and human resource, governance and trade development. Under the arrangement, the EU has committed an annual grant of 75 million euros. Over the three-year period, 90 million euros will be spent on rural development and natural resources management, 70 million euros on education and human resource development, 50 million euros on governance and 15 million euros on trade development. Briefing newsmen about the meeting, Shaikh appreciated the EU and Germany for their support to economic development in Pakistan. The minister discussed the current economic situation and measures taken by the government for stabilising and increasing revenue through tax reforms. The minister said that despite narrow fiscal space, Pakistan has not compromised on social and poverty-related spending and is pursuing a strategy to promote growth. “As a result of the initiatives to stabilise economy, indicators have shown improvement and the economy is able enough to withstand challenges,” he added. The minister thanked Germany for supporting Pakistan’s efforts to get access to the EU markets. The visiting dignitaries appreciated Pakistan’s commitment for sustaining the ongoing economic reforms programme and reaffirmed their support to Pakistan in this regard. They expressed hope that Pakistan would continue with the reform process. Niebel said that under the recently concluded bilateral negotiations, Germany had committed additional 78 million euros for education, energy, health and governance besides assuring 12 million euros for the Multi Donor Trust Fund. Out of the 78 million euros committed by Germany, 48.5 million euros will be spent on energy, 13 million euros on health, 9 million euros on governance, one million euros on education and 6.5 million euros outside these priority areas. Sir how do you consider the foreign aid, how is it helpful in making national policy & planning? & especially in the educational planning of our country? Javeria: "Sir how do you consider the foreign aid, how is it helpful in making national policy & planning? & especially in the educational planning of our country? " Foreign aid is not a bad thing per se; it depends on how it's used. In Pakistan, US aid has helped build dams (Mangla, Tarbela, etc), set up schools (PIDE, IBA, LUMS, HEC reforms etc. ), educate children (Sim Sim Hamara), kept people from starving ( Green Revolution in 1960s), improved health (vaccination programs) etc etc. As long as Pakistanis are not willing to take responsibility for their own people by paying taxes, Pakistan will need and be dependent on foreign aid. KARACHI: The British High Commissioner for Pakistan, Adam Thomson, said that transformation of the education sector is essential to safeguard Pakistan’s future. He was addressing members of the English Speaking Union of Pakistan (ESUP) at a local hotel on Thursday. The High Commissioner maintained that although the current situation in education sector seems dismal, there has been some progress. However, this progress is not fast enough. He pointed out that the global average primary school enrollment is 87 per cent but that of Pakistan is 56 per cent. Seventeen million primary school age children, equivalent to the entire population of Karachi, are out of school in Pakistan, Adam Thomson added. He pointed out that UK aid from the Department for International Development will help support four million children into school, train 90,000 teachers, fund six million textbook sets and rebuild schools in Khyber Pakhtunkhwa destroyed by militants or floods. The High Commissioner said that the UK is already working with Pakistan to assist in this necessary transformation in Pakistan’s education. He stated that the UK has more to offer Pakistan on education than any other country in the world. Adam Thomson cited founder of Pakistan Quaid-i-Azam Mohammad Ali Jinnah’s strong personal conviction that ‘education is a matter of life and death for Pakistan’. Arguing that an education transformation is possible, he cited the example of a province in Brazil where the literacy rate among eight year olds jumped from 49 per cent to 73 per cent just three years after a reform programme was launched. Adam Thomson said Pakistan could expect to start seeing the results within two years. Highlighting the strong links between Pakistan and the UK on education, he said that the UK and Pakistan are linked by history, language and educational testing. More Pakistanis still take English exams than any other nationality outside a formal government education sector. ‘We are connected, joined at the hip. We cannot flourish if you do not flourish. You cannot flourish if your population is uneducated’. The UK will support four million children in school and is set to provide 650 million pounds, equivalent to nearly Rs100 billion, over four years for primary and secondary education in Pakistan. For the first time in Pakistan, the British Council on Monday held an International Conference on Employer Engagement and Entrepreneurship for Technical and Vocational Education and Training (TVET) sector for South Asia. Administrator of the US Agency for International Development (USAID) Dr Rajiv Shah and Sindh Education Minister Pir Mazhar-ul-Haq launched the USAID-funded ‘National Reading Programme’ at Government Girls Primary/Secondary School, Sultanabad. The programme consists of three projects - two national and one focused on Sindh - that will help train teachers, improve reading skills and numeracy, and mobilise communities to support school management. It will also increase enrollment of students and ensure student retention, especially of girls. The programme aims at improving literacy and numeracy for nearly seven million children, provide training to over 90,000 teachers in teaching and assessment, and support the development of 3.2 million new readers–including 700,000 children in Sindh. USAID will be supporting the school with a reading programme under the Sindh Basic Education Programme (SBEP). USAID SBEP was started in 2011 and will span until 2016, with a budget of $ 155 million. “This is good because it supplements your education budget, a budget that is woefully under-funded. But more importantly, it establishes the need for accountability in school administration and management. We are both now accountable to citizens who look to us to be stewards of these resources. The watchdog found that the education programme had improved the quality of learning, and had shown promising early results. However, a programme for maternal and newborn health showed "significant shortcomings", and there were concerns that the humanitarian projects had done little to prepare Pakistan for future disasters. Overall, ICAI, which scrutinises UK aid, rated the country programme green/amber in its traffic light ratings system, which means it performed relatively well and provided value for money, but needed improvements. Pakistan is set to become the largest recipient of UK bilateral aid. The Department for International Development (DfID) views the country as strategically important and announced an increase in aid after its bilateral aid review last year. UK aid has already trebled from £87m to £267m between 2007-08 and 2011-12, and is expected to reach £446m by 2014-15. A chunk of the money will be spent on education, including on an ambitious programme in Khyber-Pakhtunkhwa province and another in Punjab, aimed at getting more children into school and delivering a quality education. The department's health and nutrition programmes are expected to total around £160m. The report said DfID "has no track record of delivering programmes on this scale". The team will be delivering these programmes in a difficult environment. Pakistan ranks low on Transparency International's corruption perceptions index – coming 134th out of 182 countries – and has weak auditing and budgeting procedures. The country has experienced natural and manmade disasters over recent years, including conflict in the Swat valley that displaced around 3 million people, and severe flooding in 2010 and 2011 that affected millions of people and disrupted development programmes. The country is also devolving federal power to the provinces. "This suggests that scaling up of the country programme needs to be approached cautiously and with a very active risk management stance," said the report. The report welcomed DfID's cash transfer scheme in areas hit by flooding, but "while its humanitarian projects are well conceived, DfID has only limited engagement at present in building capacity for disaster risk reduction or management, to increase resilience to future disasters", despite recommendations in 2008 that more needed to be done in this area. The design of the health programme, which trained community midwives in rural areas to support women who are not able to give birth in a health centre, was problematic, as it was competing with an existing network of trained community health workers created under another national health programme. Devolution resulted in the abolition of DfID's partner in the programme, the national Ministry of Health, which meant ownership of the project was unclear. The health programme is now being redesigned. ICAI recommended that DfID encourages more private-sector involvement in delivering health and education services, considers making resilience to natural disasters at household and community level a core part of its programme, and implements agreed standards and procedures to ensure transparency and accountability in budgeting. "Overall, we found that the DfID Pakistan programme is dynamic and innovative, with a good range of impressive initiatives," said Graham Ward, the ICAI chief commissioner. "DfID has no track record, however, of delivering programmes in Pakistan on the scale that is now contemplated. Delivering aid there also involves considerable challenges, so we believe that the planned programme scale-up needs to be approached carefully.".. ISLAMABAD: United Kingdom’s (UK) Department for International Development (DFID) has committed to provide £266 million in shape of grants to Pakistan during the current fiscal year in areas of education, poverty alleviation, development in Balochistan and the Federally Administered Tribal Areas (Fata), as disclosed during the House of Commons Committee’s review meeting. The objective of the meeting was to assess aid effectiveness being provided by the UK to Pakistan over the medium term. “During the review meeting, the UK delegation pressed upon Islamabad authorities to improve the country’s fiscal situation by mobilising tax revenues and abolishing untargeted subsidies,” said an official source. DFID has planned to provide £155 million to the Benazir Income Support Programme (BISP) for unconditional cash transfer over medium to long term, while another £124 million would be provided for conditional cash transfer under the BISP programme under Waseela-e-Taleem programme. “DFID would provide four million pounds for the Multi Donor Trust Fund (MDTF) under the World Bank’s supervision to undertake development projects in Balochistan and FATA,” said an official source. According to DFID’s findings, almost 60 million Pakistanis – equivalent to the entire UK population – lives below the food poverty line. Pakistan is off-track on the education and health millennium development goals. Half of all adults, and two out of every three women, are illiterate. One in eleven children die before their fifth birthday and 14,000 mothers die during childbirth. This entrenched poverty leads to suffering, lost opportunity and a sense of grievance; all of which undermine Pakistan’s long-term stability and prosperity. Comparatively poor data in Pakistan and frequent crises exacerbate the challenge of assessing development programmes. RH: "And western aid is still saving millions of lives in India through vaccinations, feedings, toilet construction, pre-school and primary education etc"
This is what the British media always crow about, but I find it very hard to believe. There was a recent pronouncement by a newspaper in England that British Aid to India is "lifting hundreds of millions of Indians out of poverty". This smacks of exaggerated self-promotion to the point of senseless hyperbole. Here is why: British Aid to India is about 400 Million$ per year. Assuming a population of 1 billion plus, that translates to 40-cents per person per year. How much poverty alleviation and socioeconomic upliftment do you think 40-cents per person per year can possibly achieve? To put this 400 Million$ into perspective, India's own internal tax-base spending on "social" programs (family planning, health, education, fuel, food, fertilizers etcetera) is around 36% of their government budget. This amounts to 0.36 X 275 = 100 Billion$ per year. So I just don't see this "millions of lives saved" business happening with the meager amounts of foreign aid they receive on a per capita basis. I can imagine aid saving a lot of lives in Nepal at 35% dependency. I could also imagine lives being saved in our country at 10% dependency. But at 1.1% dependency, it is hard to imagine aid "transforming the lives of millions" in India. It might help generate some self-serving photo-ops and feel-good slogans for the busy-body Western do-gooder; but beyond that, I see no significance to this whole charade of "doing good with our aid" nonsense that makes the media-rounds in England. HWJ: "What are your thoughts on all this?" India has the world's largest population of poor, hungry and illiterates...more than even sub-Saharan Africa. India has large pockets of very deep poverty in states like MP, Bihar, Jharkand, UP where millions die of hunger. Indian govt would not fill the gap after the Brits leave. (7) The Malaysians will build affordable housing in Pakistan. (13) The Europeans will build food-processing industries in Pakistan. Now this is all very well, but it BEGS the questions: WHAT will WE be doing? Or are we just going to sit back and expect the whole world to come and build our country for us? The World Bank will give $400 million for the promotion and development of education in Sindh. It would be better to take the money from the British and buy discounted arms from China in order to defend our eastern border against the nefarious designs and ill-intentions of our arch-rival India. HWJ: "They will all wind up like these anyway...."
If they "all" wound up like this, the enrollment rate would not have been rising for many years in insurgency-hit FATA. Last month, well-known Pakistani pop star, Shehzad Roy made an appearance at Harvard to talk about music, activism and his new documentary series, Chal Parha (Urdu for: Come, Teach), which highlights the extensive issues plaguing Pakistan’s education system. Broadcast on a local television channel, GEO TV, the show has gained immense popularity, fast making an impact in a country where, according to the non-profit Alif Ailaan, the government spends just 2.4 percent of its national GDP on education and where just over half of children enroll in primary school. “[Roy] embodied for us an activist who is using music to make an impact on the ground, which is why his discussants, Professor Ali Asani and I were able to have a conversation with him in light of how artists have historically played a key role in keeping governments and rulers accountable,” Chughtai said. Anwarul Haq, a frail, bespectacled cleric, sits before a class of attentive students in Darul Uloom Haqqania, one of Pakistan’s many madrassas, or Islamic seminaries. His class of 1,400 students is the most senior of 4,000 enrollees at Darul Uloom, an hour's drive from Peshawar. The students follow a 500-year-old curriculum adopted across South Asia. The oversized book used in Mr. Haq's class, a collection of ahadith, or sayings attributed to the prophet Muhammad, is centuries old and written in Arabic. Commentary written in Urdu in present-day India fills the margins. “This country was built on Islam, the idea of following God's teachings. Here we are learning how to do that,” says Haq. What students learn, and don’t learn, in thousands of such private seminaries is a matter of concern for Pakistan’s government. Under a national security policy unveiled last month, Pakistan aims to bring madrassas under tighter state control, update their curricula to tone down extremist views, and introduce subjects like mathematics and science. The goal is to turn out graduates capable of getting decent jobs who won’t be tempted to join the Taliban or other militant groups. Pakistan currently has a tenuous ceasefire with homegrown Taliban militants and has released scores of suspected militants and accomplices in confidence-building measures. Still, terrorist attacks have continued by splinter groups the Taliban claim not to control. On Apr. 9, 21 people were killed in a blast at a fruit market in Islamabad. Fears that Pakistan’s madrassas are breeding grounds for extremism are nothing new. After 9/11, the US government funded a $100 million madrassa reform program that met widespread hostility and failed to make much headway. Clerics have scoffed at the government’s new security policy and point out that they’ve already instituted the kind of reforms the government advocates. Darul Uloom offers advanced specializations in Islamic law that Pakistan’s universities accept as Master's degrees, and runs computer labs for students. Other madrassas have also upgraded their curriculum so that students, who spend much of their time memorizing the Quran, get a broader secular education. Most pupils are from poor backgrounds: madrassas offer free education, housing, and food. Majority of Pakistanis believe an Imam should be aware of other subjects including science, technology, English etc besides his religious knowledge. According to a Gilani Research Foundation Survey carried out by GallupPakistan, 72 per cent Pakistanis found it compulsory for Imam of mosques to gain knowledge of other subjects other than religious education. A nationally representative sample of adult men and women, from across the four provinces was asked “Should the Imam be aware of subjects like science and technology, English language etc. besides his religious knowledge or not?” Responding to this, 72 percent said yes while only 28 per cent rejected this idea. You might go to the principal's office to see what's going on and to ask when the staff is likely to return. But the principal is not there either. When you complain to the local education authorities they promise faithfully that the teachers will be back. While you're at it, you mention that none of the toilets at the school work and that there's no water for the kids to drink. There may not even be any chairs or desks. Or books. In the U.S. you'd be expecting to wake up about now. You'd realize it was all just an unpleasant dream and walk your children to their nice school complete with teachers, books, desks and working toilets. But if you were a parent with children in the public school system in Pakistan, you'd never wake from the nightmare. There are said to be 25,000 "ghost schools" in Pakistan. The teachers all get paid. They just don't see the need to turn up. They don't go to school, so the kids don't either. The result is one of the highest illiteracy rates in the world. With a population approaching 200 million, Pakistan is the sixth most populous country in the world, but about 54 million are illiterate. While national statistics report that 70 percent of children are enrolled in in primary education, 50 percent drop out before reaching the fifth grade. According to UNESCO's 2014 report on the state of global primary education, Pakistan has nearly 5.5 million children out of school, the second highest number in the world after Nigeria. If you have a daughter in Pakistan, the odds are stacked against her going to school at all, especially if you're living in a poor urban slum or a rural area. There remain huge disparities in the levels of literacy between the sexes. You can't blame the children. The Citizens Foundation (TCF), a non-profit that relies almost exclusively on donations from Pakistani and expat supporters in the U.S. and other countries, runs 1,000 quality schools in the country's worst slums and neglected rural areas. TCF has a long waiting list of parents desperate to get their kids educated. I recently spent a week visiting TCF schools in Karachi. Immediately outside the school walls, there's abject poverty. Inside the school gates, there are pristine classrooms, computer labs and spotless washrooms. Drinking water is provided to ensure that no child goes thirsty. This sanctuary could be a snapshot from any classroom in the world -- happy children hanging on their teacher's every word, immune to the stresses of the world outside. Now working in 100 towns and cities across Pakistan, TCF strives to maintain an equivalent enrollment of girls and boys. This is no mean feat in a nation that has marginalized women even as it elected Benazir Bhutto its prime minister, a height yet to be achieved by an American woman. To sustain this gender ratio, TCF has an all-female faculty, because parents are more likely to send their daughters to schools where the teachers are women. TCF schools have succeeded where others have failed because they've won the support of communities that have been forgotten and abandoned by the state. ISLAMABAD: Former British Prime Minister Gordon Brown has expressed his commitment to raise $450 million for bringing improvement in the education sector of Pakistan. According to a statement issued by the PM House, Brown called Prime Minister Nawaz Sharif on Thursday evening and expressed his resolve, which also includes provision of better security facilities to schools in the country. Nawaz appreciated his goodwill gesture towards Pakistan and its people, saying that he is fully aware of the continuous work that Brown is doing to improve Pakistan’s image abroad. Brown currently serves as the United Nations special envoy for global education.